Wilder-Smith, Annelies Tissera, Hasitha AbuBakar, Sazaly Kittayapong, Pattamaporn Logan, James Neumayr, Andreas Rocklöv, Joacim Byass, Peter Louis, Valérie R. Tozan, Yesim Massad, Eduardo and Preet, Raman 2018. Novel tools for the surveillance and control of dengue: findings by the DengueTools research consortium. Global Health Action, Vol. 11, Issue. 1, p. 1549930. Wiratsudakul, Anuwat Suparit, Parinya and Modchang, Charin 2018. Dynamics of Zika virus outbreaks: an overview of mathematical modeling approaches. PeerJ, Vol. 6, Issue. , p. e4526. Díaz-Menéndez, M. Trigo, E. de la Calle-Prieto, F. and Arsuaga, M. 2017. Zika virus infection during the Olympic Games in Rio: A fear or an actual risk?. Revista Clínica Española (English Edition), Vol. 217, Issue. 3, p. 155. Díaz-Menéndez, Marta and Crespillo-Andújar, Clara 2017. Zika Virus Infection. p. 83. Pomin, Vitor H. 2017. Sulfated Glycans and Related Digestive Enzymes in the Zika Virus Infectivity: Potential Mechanisms of Virus-Host Interaction and Perspectives in Drug Discovery. Interdisciplinary Perspectives on Infectious Diseases, Vol. 2017, Issue. , p. 1. Ali, Sofia Gugliemini, Olivia Harber, Serena Harrison, Alexandra Houle, Lauren Ivory, Javarcia Kersten, Sierra Khan, Rebia Kim, Jenny LeBoa, Chris Nez-Whitfield, Emery O’Marr, Jamieson Rothenberg, Emma Segnitz, R. Max Sila, Stephanie Verwillow, Anna Vogt, Miranda Yang, Adrienne Mordecai, Erin A. and Apperson, Charles 2017. Environmental and Social Change Drive the Explosive Emergence of Zika Virus in the Americas. PLOS Neglected Tropical Diseases, Vol. 11, Issue. 2, p. e0005135. Díaz-Menéndez, M. Trigo, E. de la Calle-Prieto, F. and Arsuaga, M. 2017. Infección por virus Zika durante los Juegos Olímpicos de Río: ¿alarma o riesgo real?. Revista Clínica Española, Vol. 217, Issue. 3, p. 155. Lin, HZ Tambyah, PA Yong, EL Biswas, A and Chan, SY 2017. A review of Zika virus infections in pregnancy and implications for antenatal care in Singapore. Singapore Medical Journal, Vol. 58, Issue. 4, p. 171. Burattini, Marcelo Nascimento 2016. Doenças infecciosas no Século XXI. Acta Paulista de Enfermagem, Vol. 29, Issue. 2, p. III. Massad, Eduardo Coutinho, Francisco Antonio Bezerra and Wilder-Smith, Annelies 2016. Is Zika a substantial risk for visitors to the Rio de Janeiro Olympic Games?. The Lancet, Vol. 388, Issue. 10039, p. 25. Trilla, Antoni and Trilla-Aymerich, Guillem 2016. Virus Zika: viajes, mosquitos y Juegos Olímpicos. Medicina Clínica, Vol. 147, Issue. 3, p. 113. Trilla, Antoni and Trilla-Aymerich, Guillem 2016. Zika virus: Travel, mosquitoes and Olympic Games. Medicina Clínica (English Edition), Vol. 147, Issue. 3, p. 113. McConnell, John de Ambrogi, Marco Cleghorn, Sean and Sekkides, Onisillos 2016. 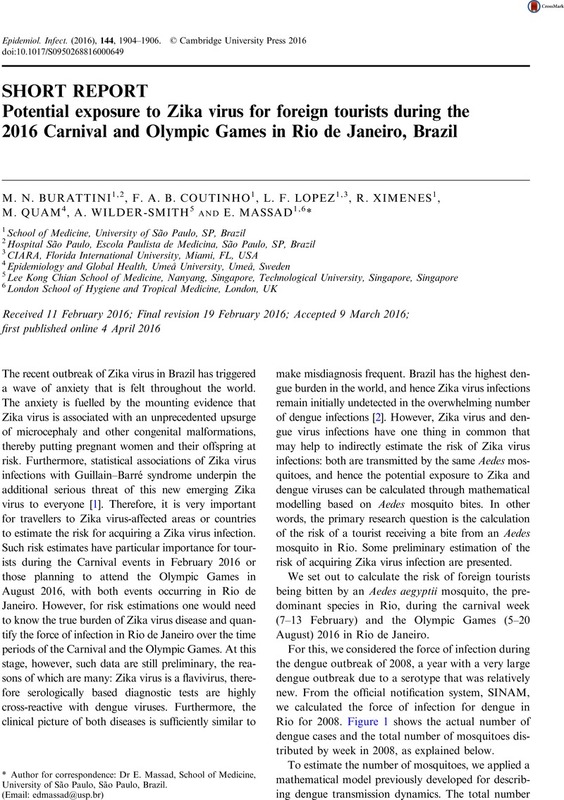 Zika virus and the 2016 Olympic Games – Editors' reply. The Lancet Infectious Diseases, Vol. 16, Issue. 9, p. 1003. 1. European Centre for Disease Prevention and Control. Rapid risk assessment: Zika virus epidemic in the Americas: potential association with microcephaly and Guillain-Barré syndrome. 10 December 2015. Stockholm: ECDC, 2015. 2. WHO. Dengue (http://www.who.int/topics/dengue/en/). Accessed 18 February 2016. 3. Lopez, LF, et al. Modeling importations and exportations of infectious diseases via travelers. Bulletin of Mathematical Biology 2016; 78: 185–209. 4. Massad, E, et al. Risk of symptomatic dengue for foreign tourists to the 2014 FIFA World Cup in Brazil. Memórias do Instituto Oswaldo Cruz 2014; 109: 394–397. 5. Delatte, H, et al. Blood-feeding behavior of Aedes albopictus, a vector of Chikungunya on La Réunion. Vector-Borne and Zoonotic Diseases 2010; 10: 249–258. 6. Sistema Nacional de Agravos de Notificações (SINAN). Ministério da Saúde do Brasil (http://www.cve.saude.sp.gov.br/htm/cve_dnc.htm). 7. WHO. Zika virus and potential complications (http://www.who.int/emergencies/zika-virus/en/). Accessed 19 February 2016. 8. Mlakar, J, et al. Zika virus associated with microcephaly. New England Journal of Medicine. Published online: 10 February 2016. doi:10.1056/NEJMoa1600651.